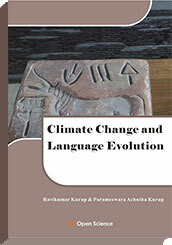 Climate change and global warming can lead to evolution of human language and linguistics consequent to alterations in Neurobiology. Climate change leads to increased endosymbiotic archaeal growth and RNA viroid secretion. They contribute to the origin of memes and evolution of human language in the presence of climate change. Memes are building blocks of mind. They are also the building blocks of culture. The memes make up language and religion. The origin of speech can also be related to archaeal RNA viroidal quasi-species consortia. Speech origin can be compared to an epidemic la tourette’s disease which consists of vocal tics, motor tics, coprolalia and obsessive compulsive disorder.